Kerbal Space Program Gamer's Edition coming - if enough people want it - Use a Potion! After the success of the Hotline Miami Gamer’s Edition physical release you now have the opportunity to purchase the next Gamer’s Edition release, this time of Mexican developer Squad’s Kerbal Space Program. 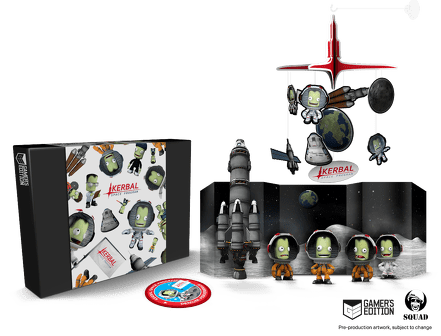 ● Four hand-painted Kerbal figurines – Bill, Bob and Jebediah Kerman plus a standard Kerbalnaut, each showing varying emotional reactions to the adventure that awaits. ● A stirring diorama backdrop – which optimistically suggests you have made it to the moon. ● Official Kerbal Space Program mobile – allowing you to ponder the hypnotic vastness of space and the quantity of space junk and unlucky Kerbals you have scattered across it. Of course it will only be produced if enough orders are made, at the time of writing requiring 2495 purchases for production. It’s an 8 week long campaign though and with the popularity of the game I’d expect it to meet its goal. The Kerbal Space Program Gamer’s Edition campaign runs from today until midnight BST (4PM PDT/7PM EDT) on Thursday 30th July and costs $80 (roughly £55). It’s available for purchase now atwww.gamersedition.com/products/kerbal-space-program.